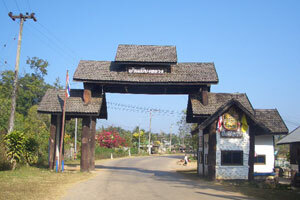 Ban Piang Luang Wiang Haeng is located along the Thai - Myanma border checkpoint is the main author of the temporary border trade at the local level when it is quiet. Dan is open to residents in the neighborhood have a trade. People in this district are the Chinese and Hong Shan. By Chinese immigrants in the walnut is the president of the Chiang Kai-Shek. However, it has not abandoned the old culture.